“We’re going on a magic school bus!” their teacher enthusiastically declared. 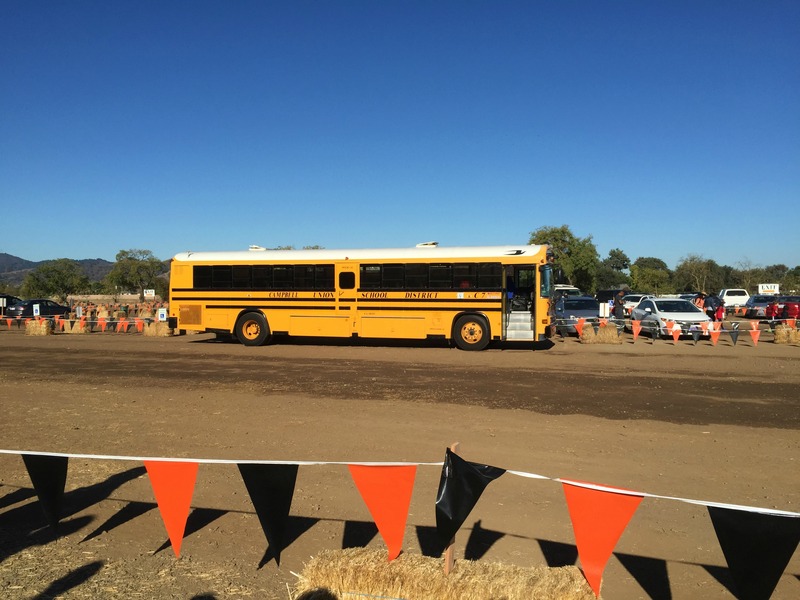 “It’s just a regular bus,” she whispered to the parents. I wasn’t sold. All the evils of a school bus combined with 60 4-year-olds? Sure sounded like a job for Mrs. Frizzle to me. I arrived the morning of our great adventure and was instructed to load up on snacks, juice boxes and wet-wipes. Done. We learned there would be one adult responsible for every child – likely due to their innate ability to worm their way into trouble – except for the muppets, they were both mine. As the parents walked down the hallway to collect their respective charges, Search and Destroy leapt out line to lunge at me. “Mommy! You’re here!” Ah, there’s that guilt I was missing. Because who could ever forget hearing, “Mommy, how come you didn’t come to our Christmas party? A half-hour after our scheduled departure time, we’d finally loaded up the majority of tiny peeps onto the big yellow bus. 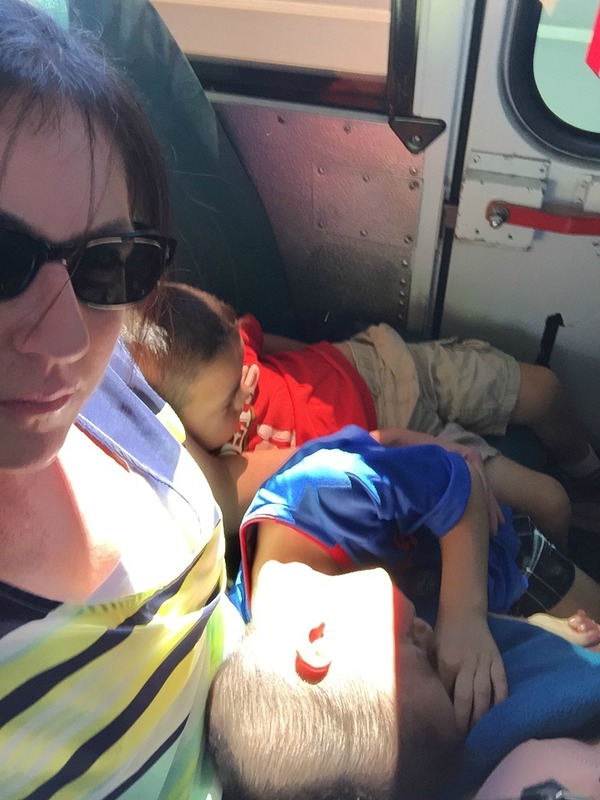 (NB: Preschoolers think the bus is an amazing novelty; related, preschoolers still fit in school bus seats.) “I’m hungry,” announced Destroy, disrupting me from the revelry of remembering the bullying torment I endured during my childhood adventures of taking the school bus. Alas, dear Search was not interested in learning about honey production procedures. He wanted to know when we got to pick out our pumpkin. I distracted him with a snack. 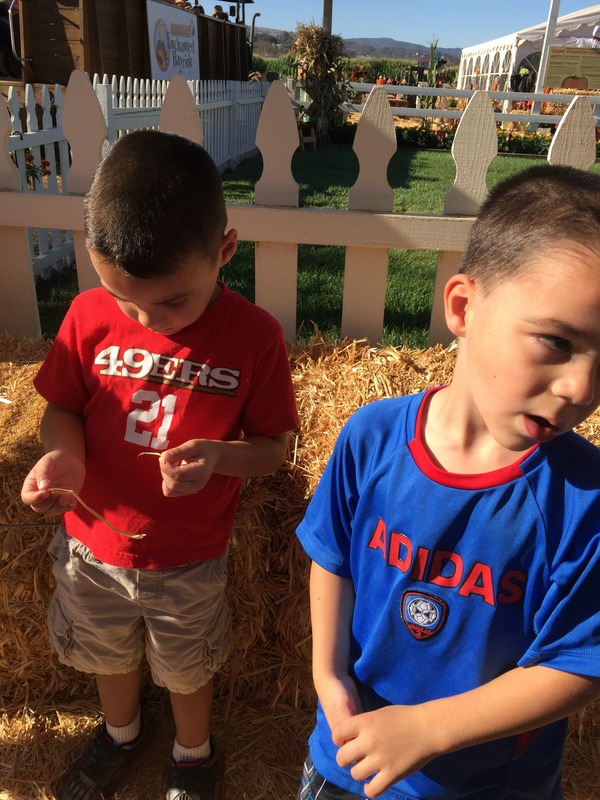 From there we headed to the hayride – the quintessential fall festivity to celebrate the season. Unless you’re a California boy and it’s 90 degrees at 9 a.m. 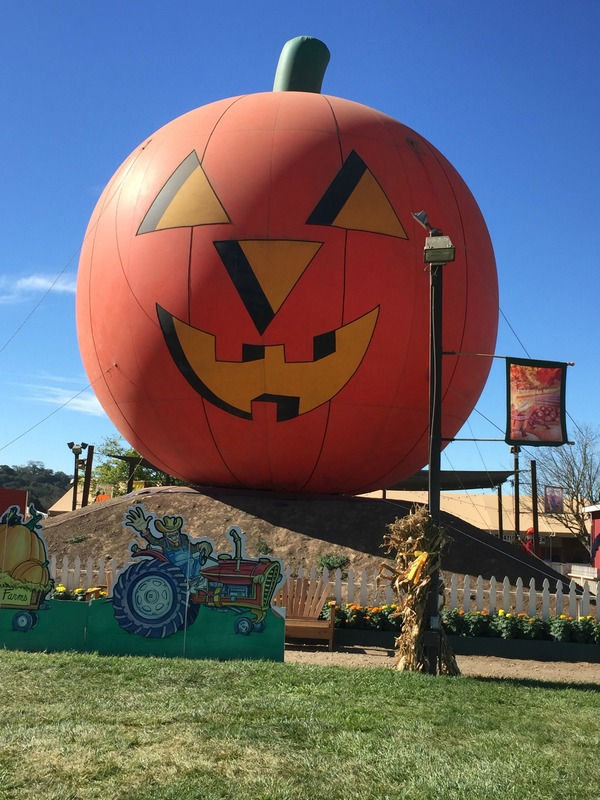 Despite Pumpkin Pete’s automatronic informational acoustics, Search spent the entire ride screaming, “POKEY!” as bits of hay breached his basketball shorts. You know what parents judging me? Y’all had one kid to deal with. I had two. This means my odds of having a well-behaved child were double yours at any given moment. Finally the moment of truth arrived. 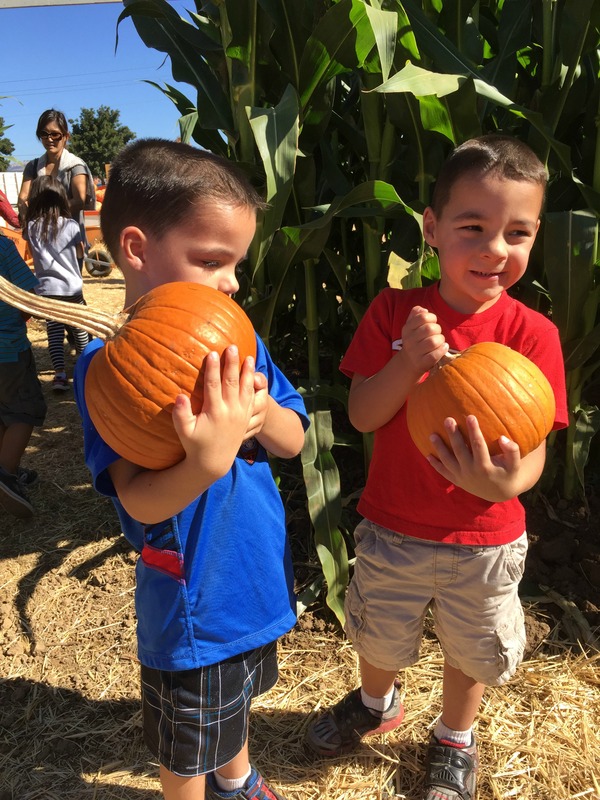 The purpose of the pumpkin patch field trip. It was time PICK YOUR PUMPKIN. All the little ones were herded into the “sugar size” patch – a small enclosure bearing produce small enough for the wee ones to carry themselves. Search and Destroy marched out carrying their prized selections. And then it happened. Search dropped his pumpkin. So much excitement leading up to this point, only to end with a child covered in the goo and guts of his chosen gourd. The very nice pumpkin people quickly replaced his pumpkin puree with a brand new pumpkin prize. Whether this was due to a wailing decibel heard across the greater Bay Area or their innate generosity will never be known. My guess is more the desire to shuttle all the little ones back onto the bus in preparation for the next Groundhog Day go-round of pumpkin selections. The entire excursion was only two hours. All were exhausted. Search and Destroy passed out in my lap – the adorableness rendering any misgivings moot. There is something special about the magic of this age, even moving parents to sympathize with the pulverized pumpkin. Preschool teachers do not get paid enough. And I was only contending with my two.